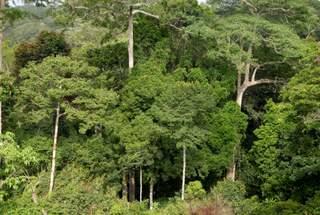 The Dja Faunal Reserve covers one of the largest and best protected rainforests in Africa. It is a wilderness barely disturbed by man, with rich and often rare fauna. This includes over 107 mammals and more than 320 bird species. It is a habitat for the vulnerable western lowland gorilla and endangered western chimpanzee. The reserve is almost completely surrounded by the Dja River, a contributary to the Congo River. It covers 5,260 square kilometres. The landscape within the enclosed area consists of a fairly flat plateau. Dja Faunal Reserve is also recognized as an Important Bird Area (IBA), a globally important habitat for the conservation of birds populations. The globally threatened Grey-necked Picathartes and the endemic Rachel's Malimbe and Forest Swallow are among the most notable birds found here. Congo River Basin: Dja River is a contributary to the Congo River. Natural sites with indigenous human population: "Two small populations of Baka pygmies live within the Reserve in small encampments, maintaining an essentially traditional semi-nomadic lifestyle"